Publishing a book is like having a baby-you wait and wait for it to arrive and then bam-the baby is a week old and you are happy and exhausted at the same time. I am so thrilled that so many of you are telling me how much you identify with so many of the stories I shared. I know I should probably have put a “Tissues required” warning label. But when you write about precious memories and the pride and love we all share for our children sometimes tears flow. I hope realizing you are not alone brings you comfort. I sure have been touched as I hear many of your experiences and hear about your military children. Thank you for welcoming my “baby” Be Safe Love Mom. Pass the word to other moms who may need a boost. Consider giving it to friends and family who may not quite understand why sometimes it can all be too much. 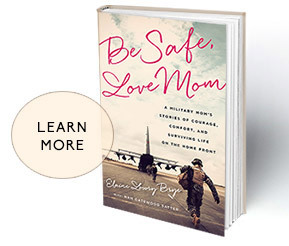 And if you know other service members tell them this book would make a great Mother’s Day gift! Then yesterday I was honored to be part of KERA Dallas NPR Think broadcast. In the days to come I will be adding more content to the web site and blogging more. In the immediate future I am heading to Ft Hood for a book signing at the PX this Saturday from 1:00-4:00 PM. You can get a pass at the Visitors Center if you need one. Come by and say hello, tell me about your military sons or daughters, or your Mom if you are buying it as a gift. It will be wonderful to meet you. Thank you again for all your support. I am so excited to be part of the Sisterhood of Military Moms. You all rock!